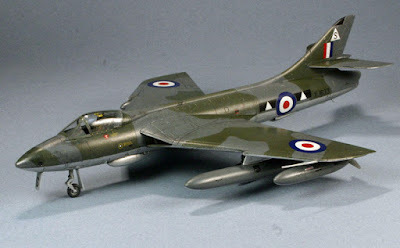 Quite a few eyebrows were raised when Airfix announced their 2010 releases. 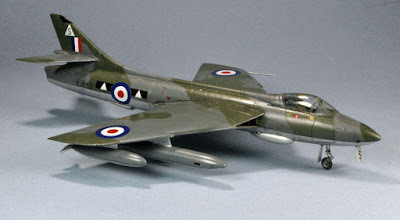 First off who actually believed that we would see an injected Vickers Valiant from Airfix in 1/72? I am excited to see a new tooled Sabre, but disappointed that Airfix decided to repeat the hard winged F-86F/Sabre F.4 that Fujimi and Hobbycraft/Academy has previously kitted. (Just how happy would modelers across the world be if they instead has chosen the Korean War vintage F-86E/Sabre F.2 with the early slatted wing? Why, Airfix, why?) But maybe the oddest choice was a new tool Spitfire Mk.I. I know that 2010 is the 70th Anniversary of the Battle of Britain, but the Airfix Spitfire I released in 1980 is by far the most accurate Spitfire yet injected in plastic. The shape is pretty close to perfect, even if the detail is a little sparse, and the kit sports raised panel lines. I just hope the new Spitfire will share the same excellent shape of its predecessor and add more detail. First indications do look good. See the exploded view at around 25 seconds into Airfix's latest promo video. As the gear legs and doors are modeled together, I expect his is the new 1/72 Spitfire Mk.I. Cockpit detail looks much nicer then the seat and floor only of the recent Spitfire IX. As a general rule Hitler isn't the least bit funny, but this is hilarious! Dr. David's Photo Hunter - Done! I had a disaster as I unmasked the dividing line between upper and lower surface colors. The Tamiya tape pulled out a chunk of the epoxy putty that had faired in the camera nose extension. I then had to mask off the nose at the first panel line, reputty (this time with lacquer based automotive putty for better adhesion), resand, and repaint all three colors. Fortunately it went well the second time through. I didn't even need to use my ready made excuse about a "replacement nose section" on the real airplane to account for mismatched camo divisions. The finishing steps took an exceptionally long time for this model. Having completed the basic finish in mid November, I was able to work in only a few minutes of modeling each week. In the process I missed self-imposed Thanksgiving (US) and Christmas deadlines, but was able to clear enough time in a week of "working from home" to complete everything by New Year's Day. One of the most challenging steps was getting the underwing serial numbers to properly span the landing gear and still keep their position perpendicular to the centerline. The gear doors are well-engineered to maintain alignment in the open position (perhaps the best engineering for this I've seen in 1/72 scale), but it means they don't lie flush in the closed position, even when anchored with Blu-Tak. The main axis of the main wheel bays is parallel to the sweep angle, not the centerline. So, the combination of angled and nonflush surfaces kept dragging the decal out of square. The Revell kit decals - sadly for a different airframe - have marks for where to cut the decal to fit, but Xtradecal (understandably) did not do this. Once the buzz numbers and the lower roundels were in place, I could add the underwing pylons and landing gear. The nose gear is very delicate. Mine snapped off at the nosewheel yoke as I removed it from the sprue. I used plastic cement to make the repair, after trapping the nose wheel between the (now separated) yoke halves. This also allowed me to pose the nose wheel at a slight turn angle for interest. I let the newly reconstructed nose wheel strut cure for 3-4 days to ensure adequate strength. There is no great positive connection for the nosewheel doors either. In contrast, the beautifully-engineered main gear was a dream to assemble, with positive attachment points to maintain angles and alignments perfectly. These reconnaissance birds usually carried four drop tanks. Revell supply only the 100 gallon size for the outer pylons. Fortunately the now-superseded Airfix Hunter FGA.9 kit includes the big 230 gallon tanks that required the flap cut-outs on the Hunter Mk 9 and subsequent variants. I robbed those and painted them all with grey tops and silver bottoms. After gloss coating, the decals, including lots of fine airfame maintenance marks from the kit decals took nearly a full day to apply. A blizzard that day allowed me to model uninterruptedly without needing to address any out-of-the-house concerns. I used Future as the "setting solution" for the Revell decals since I've had bad silvering with this brand before. I used the Microscale "system" for the Xtradecal markings, with no problems. I unmasked the canopy and was overjoyed to find no "surprises;" there was; however, the usual and troublesome tape gunk left behind. I tried a new approach to that with great success. Remembering Silly Putty's abilities to lift comics from the Sunday paper as a kid. I rolled a small ball of Blu-Tak and rolled it over the canopy. Voila, the gunk was gone and the canopy shone like a freshly Futured floor! I added the pitot tube and called her done, sending out the final official portraits just before noon on December 31. Final conclusion: This is a great kit, easily built, with almost no tricky parts. It captures the long, graceful look of the Hunter beautifully. I can recommend it without reservation. Isn't this blog supposed to be, at least partly, about modeling? Notice the complete lack of modeling content recently? Notice the Hunter never got finish? I guess being it is a new year and all I should have some great words about how I'm going to finish all these started kits, or this will be the year I meet my goal of finishing a kit a month, or I will finally defeat AMS, or some other blah...blah...blah. Something positive, motivational, and/or uplifting. Well I'm not going to do that. I haven't seen the modeling bench in weeks. So all I'm going to say is someday I will finish something. No promises, no deadlines, no nothing...wish me luck. And Mark - no the Hunter isn't done yet!